By no means was this a great movie. At the same time, I don't think it deserves to be labeled as the atrocity that many in the geekdom claim it is. This movie was the first directorial effort by the Wachowski brothers in 5 years after their epic saga with The Matrix. During the last few years as the movie was being developed, it left many in the geek world confused as why the brothers were doing this film. The whole production and post-production was shrouded in secrecy, further mystifying the creation they would unleash on the mass public. When it finally arrived, it didn't arrive with a boom... it was more of a whimper... and it quietly went away with its tail between its legs. This movie was visual eye candy at its very best. The only way I can describe its style is this: imagine eating a large pack of Crayola Crayons, then vomitting, and filming everything that came out. Stick a few colourful Lego Men in the mess, and you have Speed Racer. That said, Speed Racer does offer something a little different. Hollywood adaptations of TV shows/cartoons to movies seem to have an approach of taking the original material and adapting it to the present time, so that it is more real and in our world. The Wachowski brothers seemed to have a different approach in making Speed Racer. The movie in its entirety was basically a cartoon that was rendered with fully human characters and sceneries. Everything about the movie looked, felt, and sounded like a cartoon would. It had the complete atmosphere of a cartoon except that it was real, if that makes any sense. There were two things I really enjoyed in this movie. The first was the score pieced together by Michael Giacchino. Giacchino is no stranger to the geek world having worked on such geek-works as Lost, MI3, a few Brad Bird films, and a few video game scores. What helped the movie capture the feel of a 70s-80s cartoon was the music that accompanied all the action and zaniness; it seemed plucked right out of a Hanna-Barbara cartoon from days old. The second thing I enjoyed had everything to do with Chim Chim. This little simian was just a delight to watch; be it sneaking around jets to find candy or flinging monkey-poop at villains. The relationship he had with Speed's younger brother Spritle helped give the movie a lot of heart. The performances all around were pretty good. Emile Hirsch again proves that he's a gifted young actor. It is strange to see him going from such a visceral film as Into the Wild to such an over-the-top film. He delivers a grounded performance which is what the movie needed amidst all the wackiness. One of the main problems was the length of the movie. At 135 minutes, it was a lot of visual diarrhea to take in, and in the end it felt exhausting. I think it would have been more enjoyable as a quick 90 minute action adventure. I don't blame this movie or its distributors for flopping this summer. This was an extremely tough sell. It's hard to say who this movie was aimed at. 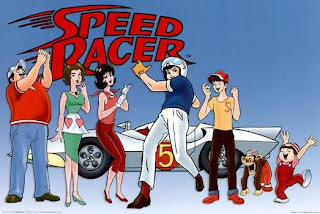 I don't think kids these days are familiar enough with Speed Racer and the older geeks that grew up watching it would probably lean more for Iron Man instead. It could have benefitted with a mid-March or Christmas release. Amongst all the high profile releases in May, Speed Racer just seemed lost in the shuffle. Like I said, on the whole, it wasn't a great movie, but it wasn't a steaming pile of guano either. That's about it for now. Later geeks.